In organic weed management, the name of the game is to keep the crop ahead of the weeds. Whereas timely cultivation knocks the weeds back, the most economical and soil-friendly way to make sure the vegetable crop has the upper hand is to optimize the health and vigor of the crop itself. Healthy plants are much less likely to become overwhelmed by a given weed population level than are weak, stressed plants or thin, spotty stands. The best weed deterrent is a solid stand of desired vegetation that completely occupies the growing space, both aboveground and belowground. The challenge for organic vegetable farmers is that most annual crops are inherently vulnerable to weeds early in the season when the crop is small. Moreover, some vegetables, such as carrots and onions, grow slowly and may not fully occupy the space even at maturity. 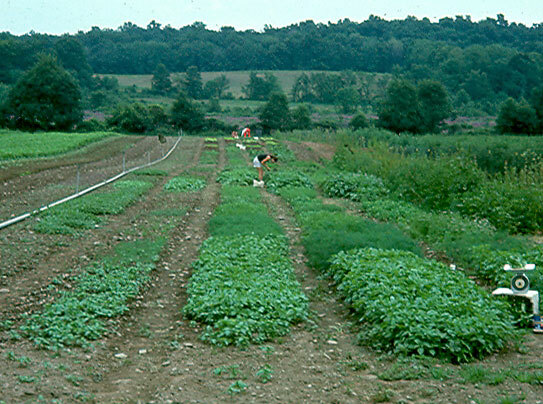 However, optimal crop management can make any vegetable more weed-tolerant and weed-competitive. Vegetables that emerge, establish, and grow rapidly get through their “critical weed-free period” early in the season, and those that quickly form a closed canopy (completely shading the field or bed) can hinder weed growth and reproduction in a manner similar to cover crops (Fig. 1). Figure 1. 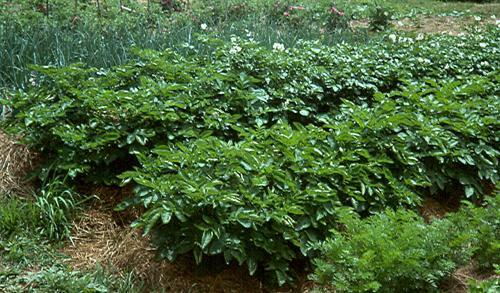 This vigorous potato crop occupies and shades most of the bed, leaving little space for weeds. Figure credit: Mark Schonbeck, Virginia Association for Biological Farming. Following are several management practices that can contribute to crop competitiveness. Choose vigorous, locally-adapted crop varieties. Grow and use vigorous transplants when appropriate. Maintain healthy, living soil that suits the crop to be grown. Choose optimum planting dates whenever practical. Select row and within-row plant spacings to enhance crop competitiveness. Maintain optimum crop growing conditions. Feed and water the crop, not the weeds. Crop varieties that are well suited to the farm’s climate, rainfall patterns, and soils will grow more vigorously than varieties bred for a hotter, cooler, wetter, or drier climate, or for regions with a substantially different soil type. Find out from neighboring farmers and local seed suppliers what varieties seem to work best in your locale. Compare several varieties side by side to see which ones get established quickly and seem to outgrow the weeds. For example, in the southern Appalachian region, ‘Danvers’ carrot produces a large, dense top that shades out weeds by the middle of its growth cycle; ‘Nantes’ forms less top growth and requires more weeding; and some modern, early cultivars like 'Minicor' have small, thin tops, and must be weeded regularly until harvest maturity. However, the relative performance of these carrot varieties in another region or climate may be quite different. In a review article, Callaway (1992) reported evidence of significant varietal differences in weed tolerance or competitiveness in all 21 crops investigated, including potatoes, squash, beans, and carrots, as well as cereal grains, pulses, and forge crops. Hill (2006) recommended looking for the following traits when choosing varieties for competitiveness. Rapid emergence – Planting hybrids/varieties that emerge quickly will give the crop a head start over emerging weeds, helping them to establish and better compete. Quick canopy closure – Once the canopy closes it reduces the amount of light that reaches the soil surface which some small seeded weed seeds need to initiate germination. The faster the canopy closes the more weeds it shuts out. Efficient nutrient scavenging – Logically, crop varieties that are efficient in utilizing nutrients will perform better and they may help prevent weeds from taking up nutrients. Indeterminate growth habit – Because indeterminate crops continue to grow throughout the season, they are less likely to be shaded out by weeds. Drought tolerance – Drought tolerant plants that are better water scavengers will be better equipped to compete with weeds. One of the most common causes of weak crop stands is old or inferior seed (Fig. 2). Even before an aging seed lot’s germination percentage falls below 80%, the vigor of the emerging crop may be seriously reduced, and its critical weed-free period is far longer. Much added labor may be spent on early season cultivation or manual weeding just to get such a crop established. Figure 2. 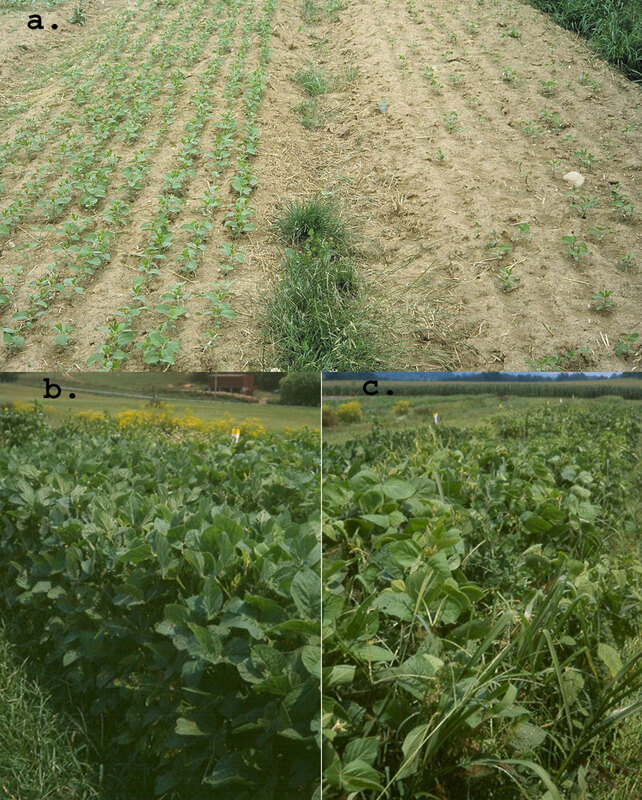 In this trial of forage soybean varieties as cover crops, a good stand in one variety contrasts with a spotty stand in another that resulted from poor quality seed (a). At 61 days after planting, the crop from good seed is vigorous and nearly weed free (b) whereas the crop from poor seed is weedy (c). Figure credits: Mark Schonbeck, Virginia Association for Biological Farming. Throw away old seed that shows declining vigor and obtain fresh, high quality seed—unless the old seed lot represents a valuable or irreplaceable strain that you want to be sure to propagate. In this case, consider starting the seeds in flats, cells, or nursery beds and selecting the fastest-emerging and most vigorous seedlings for transplant into the production bed or field. This will have the effect of selecting the strain for seed longevity and vigor. If the crop is not amenable to transplanting, then double or triple seeding rates, thin out the weakest seedlings if necessary, and be prepared to do some extra weeding. Growing vigorous “starts” and transplanting them to the field is an excellent strategy for giving small-seeded crops a head start on the weeds. Transplanting effectively shortens the minimum weed-free period during which timely cultivation is required, often by several weeks. Most organic vegetable farmers transplant tomato, pepper, eggplant, onion, leek, celery, broccoli, cauliflower, and cabbage because their small seedlings would be very susceptible to weed competition if direct-sown in the field. Transplanting onions, for example, can double yields and halve weeding labor (Ascard and Fogelberg, 2008). Lettuce, kale, chard, and other greens can be either direct-sown or transplanted. Large-seeded vegetables like beans, peas, corn, squash, pumpkin, cucumber, and okra are usually direct-sown, although farmers sometimes start them in the greenhouse in order to get an earlier harvest. Again, transplanting—if done carefully to minimize the setback of transplant shock—can give any of these crops a jump on the weeds. Root crops like carrots and parsnip cannot be transplanted, and therefore require a good early-season weed control strategy until they get established. A few growers have transplanted beets, turnips, and rutabagas with some success. Use a high quality potting mix and manage greenhouse growing conditions carefully to produce really vigorous transplants. Worm castings (vermicompost) at 10% of the total volume of the mix have been shown to enhance vigor and reduce transplant shock. Be sure to set the transplants out in the field at the right stage. Planting them too young, or letting them get too old and rootbound in the flat, results in a longer recovery period and the advantage over weeds is lost. In order to minimize transplant shock, plant in the evening or during cloudy, mild weather. Many growers water transplants with a seaweed extract solution, compost tea, or other organic fertilizer to speed establishment. NOTE: Certified organic growers should check with their certifier regarding use of compost tea or worm castings, as some restrictions may apply, especially if compost starting materials include manure. For food safety reasons, USDA Organic rules state that manure, or amendments that include or are derived from manure that has not gone through a hot composting process (>131°F) cannot be applied within 120 days prior to vegetable harvest. Organic farming practices emphasize the soil life and the soil organic matter cycle, fueled with a diversity of organic inputs—cover crops, compost, organic mulch, crop residues, manure—as the primary source for crop nutrition. A healthy, biologically-active soil that cycles and releases nutrients well supports healthy, vigorous crops that better tolerate weed pressure. Consider building and maintaining raised beds, and restrict foot and vehicle traffic to alleys between beds. Chisel plow or subsoil to relieve hardpan if needed, then keep further tillage to the minimum needed for planting and weed and pest control. Include cover crops in the rotation, use organic mulches when appropriate, and provide other organic inputs. These measures promote a deeper topsoil in good tilth that fosters large, healthy crop root systems, and provides a larger reservoir of moisture and nutrients. Strive to match soil to the crops being grown, in terms of pH, drainage, aeration, and—when practical—texture. If the soil is too acid, too alkaline, too wet and clayey, or too dry and sandy for a particular vegetable, those weeds that are better adapted to these soil conditions will likely outcompete the vegetable. For example, brassica family vegetables such as cabbage prefer a nearly neutral soil (pH 6.5–7). The cabbage can survive and grow in a moderately acid (pH 5.5); however the weeds that thrive in these conditions will tend to outgrow and suppress the crop. Weed communities in a field can reflect soil conditions or field management history. Severe or recalcitrant weed problems can point to an underlying soil imbalance such as excessively acid or alkaline pH, deficiency or excess in certain nutrients, hardpan or poor drainage, low organic matter or depleted soil life, or a history of monoculture or overtillage. Correcting these imbalances will enhance crop vigor and may reduce weed pressure. Provide as much of the crop’s nutrient needs as possible through soil biological processes supported with cover crops and other organic inputs. Add organic fertilizers and natural mineral supplements as needed to maintain enough—but not too much—of each essential plant nutrient. NOTE: because the USDA Organic Program restricts the use of some fertiizer inputs, it is important for certified organic growers to plan their supplemental fertility program ahead of time and have their certifier review and approve it before implementation. See Can I Use This Input On My Organic Farm? for further information. More is not always better, especially when it comes to NPK! Many weeds respond to high levels of available nitrogen (N), phosphorus (P), or potassium (K) with greatly accelerated growth as well as nutrient uptake. For instance, the growth rates of common lambsquarters, common ragweed, foxtails, and some other weeds continues to increase with increasing available N, well beyond the point at which the growth of corn—one of the heaviest-feeding crops—levels off. Barnyard grass and ragweed can accumulate tremendous amounts of NPK, stealing the nutrients from the crop. Quack grass responds to high N, though not P or K, while pigweeds, velvetleaf, and hedge bindweed respond to high overall nutrient levels with rapid growth. If more N is provided than the crop actually needs, any of these weeds can gain a competitive advantage, and problems with rampant weed growth may indicate that too much N has been applied. Timing of nutrient availability is also critical, and should parallel crop uptake. Small-seeded weeds start out with little nutrient reserve, and thus require ample soluble nutrients from the soil immediately after emergence in order to grow rapidly and compete with the crop. Many crop seeds are larger, providing the seedling with nutrients long enough to get established. Some small-seeded vegetables germinate and establish slowly, and do not begin absorbing a lot of nutrients until several weeks after planting. As a result, applying too much soluble N, P, or K at planting makes more nutrients available early in the season than the crop can use, and thereby opens a wide window of opportunity for weeds to appropriate the nutrients and the space. Slow-release nutrient sources, or nutrients applied as a sidedress once the crop is established, can tip the balance more toward the crop. For example, lambsquarters grows larger and competes more severely with corn when the crop is fertilized with soluble N fertilizers than when the crop is planted after a crimson clover green manure that releases the same amount of N over a longer period of time during crop development. Manage manure inputs carefully. The nutrients in raw manure tend to be more soluble and more likely to promote weed growth than nutrients in composted or well-aged manure. Manure that has not been hot-composted (140°F for at least a week) often contains abundant viable weed seeds. Compliance with organic certification standards with regard to timing of uncomposted manure applications in vegetable crops coincidentally helps to reduce manure-related weed problems. In addition, heavy annual manure inputs—whether fresh or composted—can build up very high soil N, P, and K levels, creating the fertile-but-weedy soil conditions found in many intensively-managed organic vegetable fields and gardens. When using manure or organic fertilizers, try to balance P and K inputs with amounts removed in harvest. If additional N is needed, use legume cover crops to fix atmospheric nitrogen. Finally, keep an eye on secondary nutrients (calcium, magnesium, and sulfur) and micronutrients (boron, zinc, copper, iron, manganese, and molybdenum), as subtle deficiencies in any of these can weaken crop vigor and weed-tolerance before visible foliar symptoms show up. Keeping the soil’s base saturation with calcium above 60% and magnesium between 10 and 20% has been claimed to reduce weed pressure in most crops, but the scientific jury is still “out” on this guideline. Effects of base saturation levels on crop and weed nutrition vary with soil type, soil texture, clay mineralogy, organic matter, and climate. Soil test levels for micronutrients can be deceptive. Often, the best way to evaluate crop nutritional status for secondary and micronutrients is a foliar nutrient analysis on the crop. Each vegetable crop has a range of optimum planting dates, during which soil temperature and moisture conditions favor rapid emergence and establishment, and conditions are likely to remain favorable throughout the crop’s growth and maturation cycle. Planting at these times will give the best yields and least weed problems. Conventional production systems tend toward earlier planting of warm-season crops, relying on selective herbicides to knock out weed competition. Therefore, vegetable and row crop farmers who are transitioning to organic production are often advised to “delay planting” until the soil is warm enough for optimal crop growth, and to use the extra preplant time to germinate and cultivate out the spring flush of weeds. Market conditions often create incentives to extend the harvest season of tomato, lettuce, and many other vegetables by planting earlier or later than normal. However, planting vegetables when the weather and soil are either too cold or too hot stresses the crop and leaves it vulnerable to those weeds that better tolerate the prevailing conditions. For example, tomatoes and sweet corn planted early in pursuit of early markets get off to a slower start and suffer more weed pressure than the same crops planted a couple weeks later when the soil is warm. Conversely, lettuce planted in late spring must grow through summer heat to which it is not ideally adapted; summer weeds may outgrow the stressed lettuce crop. Whenever practical, choose planting dates for each vegetable that will allow that vegetable to develop under its optimum temperature regime. Many vegetables can be “succession planted” over a relatively wide range of optimum dates. When market demands or opportunities necessitate earlier or later planting dates, use good season extension practices such as high or low tunnels, row covers, shade cloth, and drip or sprinkler irrigation to minimize stress on the crop (Fig. 3). Choose cultivars that are best adapted for season extension, such as ‘Jericho’ lettuce for summer production, or ‘Glacier’ tomato for early planting. Be prepared to devote some extra labor to weed control while the crop is first getting established. Figure 3. Grower Anthony Flaccavento of Abingdon, VA (Appalachian region) started early summer squash and snap beans under row covers supported on hoops, and began harvesting at the summer solstice despite a cool spring. 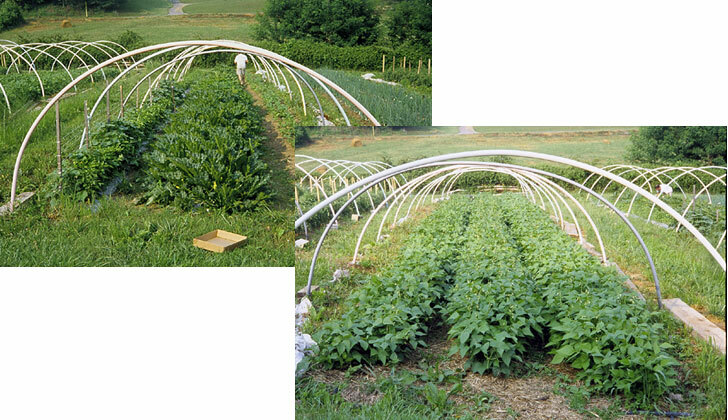 The low tunnels created a favorable microclimate for these early plantings so that they grew vigorously and fully occupied the bed by the time the photos were taken (June 21, 2005). Figure credits: Mark Schonbeck, Virginia Association for Biological Farming. Space plants close enough together so that the crop competes effectively with weeds, but not so close that the vegetable plants restrict each other’s growth. The closer together crop plants stand, the narrower the open niches in space for weeds and the faster they get shaded over by the crop canopy. However, at some point, increasing density causes the crop to compete against itself, resulting in loss of yield, quality, or both. Vegetable production manuals give guidelines for between-row and within-row spacings for different crops. However, the actual optimum for any vegetable will vary with variety, climate, soil, weed pressure, and equipment in use and will need to be adapted for each farm through observation and experiment. Some small-scale vegetable growers, especially those who practice Biointensive Minifarming, utilize an equidistant spacing within and between rows, setting vegetable starts uniformly over the bed, at the closest spacing that is compatible with good yield and quality. This may not be practical in mechanized operations that require space between rows for tractors and cultivation implements, or for crops that require plenty of air circulation to prevent disease. Thus farmers more commonly set out or thin plants to a certain distance apart within the row, with a larger distance between rows. In practice, many considerations go into selecting row spacing. Precise row spacing matched to cultivation equipment is essential for effective weed control in mechanized vegetable production. Narrow row spacing hastens canopy closure to shade out weeds, whereas wider row spacing may allow for more effective between-row and near-row cultivation. Wide row spacing is normally used for large vegetable crops like squash or tomatoes. Vegetable farmers growing crops on raised beds often use a combined approach, with double or multiple rows set on a relatively narrow spacing on the top of the bed, with a much wider spacing corresponding with the alleys between beds. This promotes early canopy closure within the bed, while allowing for continued cultivation or mowing between beds. With beds laid out on five or six foot centers, broccoli and other brassica crops are typically planted in double rows, and smaller vegetables like onions and carrots in three to four rows per bed. When weed pressure is light and growing conditions are optimal, salad greens such as mesclun, spinach, or baby lettuce can be sown in as many as 10 rows per bed, with rows spaced three or four inches apart. Good organic vegetable cultural practices include (as needed): irrigation, supplemental fertilization, integrated pest and disease management, and practices to reduce other environmental stresses (shade cloth on summer lettuce, for example) throughout the crop’s growth cycle. Anything that negatively affects crop growth and development tends to increase its susceptibility to weed pressure. Timely irrigation, foliar feeding, beneficial insect releases, or other pest management practices can be as important as timely cultivation in keeping the crop ahead of the weeds. Apply preplant and sidedress fertilizers within or next to the crop row. This way, the crop gets the lion’s share. Use slow-release nutrient sources, especially for long-season vegetables like tomato or winter squash. Quick-maturing, heavy-feeding, cool-season crops like spinach, lettuce, and broccoli require a lot of N in a short period at a time when the soil is fairly cool and slow to mineralize organic N. Thus, some faster-releasing organic N fertilizer may be needed for crop vigor and yield. Place the N within the crop row to be sure it feeds the crop and not the weeds. 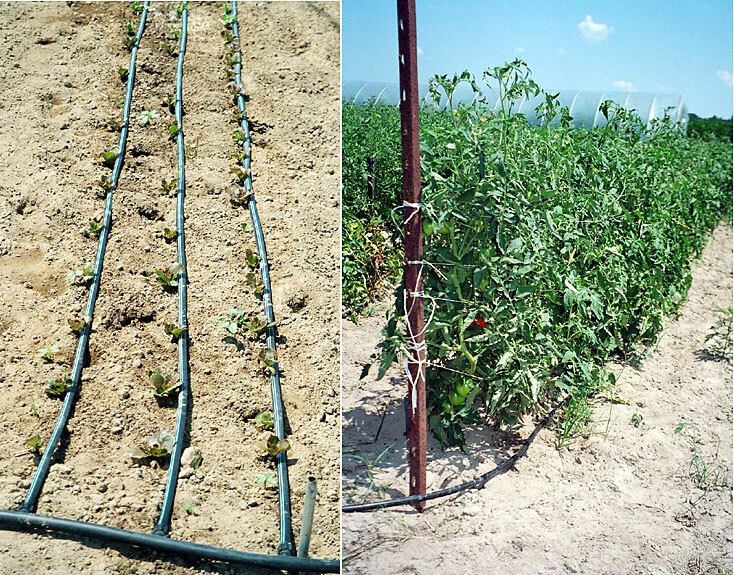 Place drip irrigation along or directly under crop rows (Fig. 4) to water the crop while leaving between-row weeds dry. Subsurface drip irrigation in crop rows is even better as it favors the crop over small, surface-germinating weed seeds within the row as well. This system greatly reduces the growth of between-row weeds, compared to either overhead sprinkler or furrow irrigation (Liebman and Gallandt, 1997). Liquid organic fertilizers like fish–seaweed extracts can be applied through drip lines. This strategy can give the crop a huge advantage especially during a somewhat dry season or in “lean” soil. Spreading a low-N organic mulch like straw between rows of an established vegetable crop can further accentuate the crop’s advantage, as well as conserve moisture. Figure 4. Drip irrigation lines laid along crop rows water the crop without giving moisture to between-row weeds at Charlie and Miriam Maloney's Dayspring Farm in Cologne, VA (Tidewater region). Likewise, liquid organic fertilizers delivered via the drip lines can selectively feed the crop. Figure credit: Mark Schonbeck, Virginia Association for Biological Farming. Note that most weed seeds cannot germinate in dry soil, and small-seeded weeds germinate from near the surface. Sowing larger-seeded crops or transplanting starts into a clean seedbed that is quite dry at the surface yet has good moisture at one inch depth and below, is another way to “water the crop and not the weeds” (Liebman et al., 2001). One drawback of overhead irrigation is that it ensures adequate moisture to germinate the near-surface weed seeds, unlike subsurface drip. Dr. Ron Morse and others at Virginia Tech are experimenting with zone planted cover crops, with a nitrogen-fixing legume in future vegetable crop rows or beds, and a cereal grain or other grass in alleys (Fig. 5). The legume breaks down faster and leaves some extra N for the vegetable, while the grass forms a more persistent, strawy mulch that does not feed N to between-row weeds, and physically hinders their emergence. Figure 5. 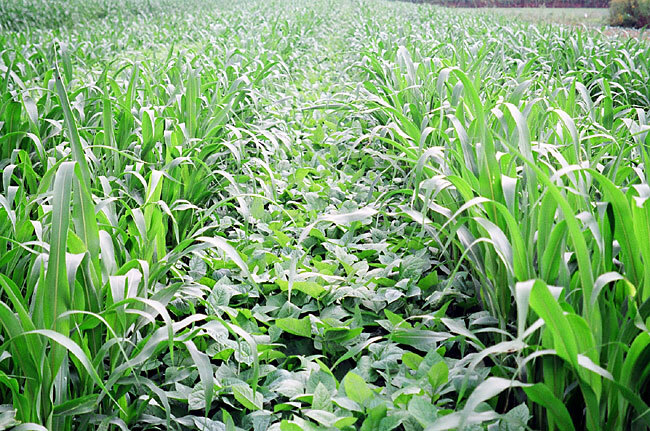 This "zone-planted" cover crop is providing nitrogen (via nitrogen fixing soybean) in the "grow zone" of the future vegetable crop, while sorghum–sudangrass growing in the alleys between crop beds forms strawy, low-nitrogen biomass and further suppresses weeds through allelopathy. Photographed at Virginia Tech's Kentland Agricultural Research Farm. Figure credit: Mark Schonbeck, Virginia Association for Biological Farming. Some vegetable are simply not vigorous enough to compete with even moderate populations of weeds. Plant these in the cleanest fields available. Plant the most weed-competitive crops and varieties in the more weedy fields, using all of the above strategies to maximize the crop’s advantage. In a field infested mainly with cool season or early spring-germinating weeds, grow a heavy winter cover crop, and follow with warm-season vegetables. In a field with heavy summer weeds, plant fast-growing summer cover crops and cool-season vegetables. For slow-starting, weed-sensitive crops like carrot, or for solid-seeded salad greens like baby lettuce (Fig. 6), clean fields further by preparing a stale seedbed or false seedbed. Cultivate the top several inches of soil to encourage weed seed germination, wait until the weeds emerge, then cultivate again. This can be done once or several times in succession to draw down a heavy weed population. Make the final cultivation as shallow as possible to avoid stimulating any further germination—or better yet, flame-kill this last flush of weeds. Plant the vegetable immediately after the final cultivation or flame weeding to maximize the advantage gained. Figure 6. These salad greens, planted in narrow rows and harvested only four or five weeks after sowing, require a weed free seedbed to avoid getting young weeds in the harvest, which reduces market value. Stale seedbed or cultivated fallow prior to planting can eliminate most of the weeds that would otherwise come up with the crop. If additional greens are planted after the first crop is harvested, shallow tillage to prepare the seedbed helps maintain the required weed-free conditions. Figure credit: Mark Schonbeck, Virginia Association for Biological Farming. These measures will not alone solve all weed problems, but they will substantially reduce labor bills for weed control. Ascard, J., and F. Fogelberg. 2008. Mechanical in-row weed control in transplanted and direct-sown bulb onions. Biological Agriculture and Horticulture 25: 235–251. (Available online at: http://orgprints.org/15415/) (verified 23 March 2010). Callaway, M. B. 1992. A compendium of crop varietal tolerance to weeds. American Journal of Alternative Agriculture 7: 169–179. Hill, E. 2006. Keys to long-term weed management. New Agriculture Network Vol. 3 No. 1. Liebman, M., and E. R. Gallandt. 1997. Many little hammers: Ecological approaches for management of crop–weed interactions. p. 291–343. In L. E. Jackson (ed.) Ecology in agriculture. Academic Press, New York.